New play by the author of Master Class and Love! Valour! Compassion! Frederick Weller and Tyne Daly in Mothers and Sons. Photo by Joan Marcus. 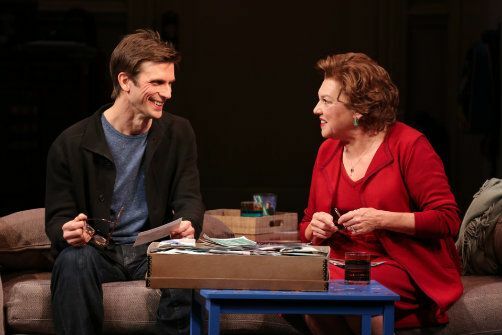 BOTTOM LINE: This unchallenging new play about a mother’s grief for the son she lost from AIDS will satisfy, but perhaps not stimulate, most Broadway audiences. Mothers and Sons opens with two people standing together in a tony upper west side apartment, looking out at the spectacular view of Central Park. This first image captures Terrence McNally’s new play perfectly—these two people stand together, isolated in their shared grief. I won’t say the play goes downhill from here—it doesn’t. But it doesn’t add much either. While Mothers and Sons is a perfectly fine play about grief, loss, and the changing nature of family, not to mention the importance of never forgetting the tragedy of AIDS, it also doesn’t really offer much that is new to anyone familiar with work on these themes. The woman is Katherine, also known as Andre’s Mother (the title of a 1990 television play by McNally, featuring the same characters); the man is Cal, Andre’s former lover. Andre, of course, is the missing link, the man who died of AIDS when he was far too young, and who has remained with these two people ever since. Katherine, who (unhappily) lives in Texas, has not seen Cal since Andre’s memorial service twenty years earlier, but has dropped by unexpectedly to return Andre’s diary. Over the course of the next 90 minutes, the two alternate between sharing stories and competing over who loved, and lost, the most. Katherine was never comfortable with her son’s “lifestyle,” and seems to blame Cal for everything that happened to Andre after he left Texas. She is also newly widowed, completely alone, and angry at the world. When Cal’s husband and son come in from the park, she is also confronted with the tangible evidence of the life that Andre might have had, not to mention the fact that Cal has apparently been able to move on, while she has not. Tyne Daly gives a tremendous performance as Katherine—the deep undercurrent of grief when she says something as seemingly innocuous as “I remember the ducks” (at Andre’s memorial in the park) is heart-breaking. Daly also provides many laughs throughout the evening; while Mothers and Sons certainly isn’t a comedy, Daly deftly expresses the profound humor that comes when a situation never stops being awkward or uncomfortable. If Katherine’s continued ignorance at times strains belief (she claims to have never heard of the AIDS quilt), this might be explained by her refusal to learn about anything AIDS-related once her son died. And if Katherine’s inability to remember Cal’s husband’s name might seem like a heavy-handed playwriting device for developing character, it also speaks to the fact that her anger is the only thing she has left. Daly is probably THE reason to see this play. I was less impressed by Frederick Weller’s performance as Cal; while I have enjoyed his work in the past (Take Me Out, for example), here he is a bit “schmacty,” like he is working too hard to express strong emotion. I must also admit, I never truly bought Weller as a gay man. Bobby Steggert, on the other hand, is perfectly respectable as Cal’s (much younger) husband Will, a man who is fed up with competing with the ghost of someone he never knew, and who tries his hardest to be civil to the woman invading his home. Terrence McNally is no stranger to Broadway, and his new play fits in well here—but this isn’t fully a compliment. Certainly, Mothers and Sons manages to hit many of the “topical” points in contemporary gay politics—did you know that gay people can now get married and have kids? Yet it also manages to show McNally’s tunnel vision when it comes to gay people. If McNally wants to address universal themes like grief and family, he does so through rich white people who live in fancy Upper West Side apartments, ones who make enough money to have a kid through surrogacy and then stay at home to take care of him. Indeed, that the biggest struggle in Cal and Will’s evening is to be confronted by a well-dressed woman who may not approve of them smacks of a certain kind of privilege that McNally may likely not even be aware of. This certainly doesn’t make Mothers and Sons a bad play. But it does make it a safe one.